Recently, the gang at SketchUp received a very interesting phone call from a gentleman named Christian Sarkar. He had initiated a challenge to see if someone could design a radically affordable $300 house for the poorest of the poor. At first, we were skeptical, but Christian’s passion, thoughtfulness and vision won us over and we thought SketchUppers were just the group up to this task. So here goes: The challenge: Design a simple dwelling that can be constructed for under $300 which keeps a family safe, allows them to sleep at night, gives them both protection from the elements and a sense of dignity. The project is asking anyone – from designers and architects, students and professionals, to submit their designs in an effort to find affordable housing solutions for the poorest of the poor. 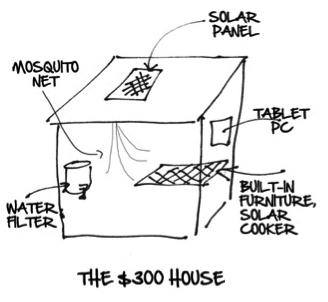 The $300 House project began as a challenge to businesses in a Harvard Business Review blog post by Dartmouth professor Vijay (V.G.) Govindarajan and co-author Christian Sarkar, an independent marketing expert. Winners will be selected by the online community and an expert panel of judges – which includes Yves Behar, Rahul Mehrotra, Bob Freling, Stuart Hart, and others – along with celebrity judge David Hinds of reggae supergroup Steel Pulse. In addition to a cash award, winners also receive a scholarship to a two-week workshop to both build actual prototypes of the $300 house, as well as operationalize a social venture to manufacture and distribute the homes. Some emerging-world governments are beginning to realise that providing security of tenure is the only way to deal with the problem of ever-proliferating slums. And big companies that face stagnant markets in the West are increasingly fascinated by the “fortune at the bottom of the pyramid”. Bill Gross of Idealab reckons the market for cheap houses could be worth at least $424 billion. But in reality it is worth far more than that: preventing the Earth from becoming what Mike Davis, a particularly gloomy follower of Marx and Engels, has termed a “planet of slums”. There are a little over 2 weeks left in the contest and you can take a look at some of the submissions here. ermmm .. nice house .. very cheap..
compare homeowners insurance companies and rates for free.